Van Horne's former western car - used during CPR construction - is found and preserved. 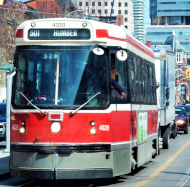 'Vacation weather' at Portage; Symington; Overview maps and timetables. Winnipeg; the Lord Selkirk II; CP yard; Greater Winnipeg Water District; 19Y hoop at Portage. Prairie Dog Central and its former route; Portage yard activity and map; loading covered hoppers with grain. Mennonite Heritage in Steinbach; Wheat harvesting circa 1910; Old maps of southern Manitoba; Wartime propaganda; Coal trains. Portage westbounds; Austin MB 1905 grain elevator; Wooden boxcar from 1914; Prairie branch line map 1891-1931; Burnside elevator; Intermodal at dusk. Spruce Woods Provincial Park; Lake Agassiz; Local Equated Tonnage Ratings and the lay of the land; Wheat crop 1913 infographic; Barry switches at Headingley; Marathon and Sault Ste Marie scenes. Eastern Alcos; Algoma Central; White River; Heron Bay; Winnipeg yards; trains at Portage. A Different kind of Canadian railway; The Prairies are angry; The Times; The Money? ; 1913 chaos at Port Nelson and in the Commons; Floating north; World War Two; Unforeseen benefits. Off to Hudson Bay! .. Saskatchewan; At The Pas; In to Thompson and out with piggyback; The Longest Day; Churchill gets it - an overview; We're not Canadians.. vs I'm telling you how it is! A quick look at the elevator and some railway features of Churchill, Manitoba. More photographs, some local history, information from a 1969 Manitoba Royal Commission. The last day southbound and evidence from the 1969 Royal Commission on Northern Transportation. Stations, 1920s map, Waghorn's Guide, 1920. At day's end, some GMD-1s visit Portage. Trains, elevators, scenery and Correction Lines. 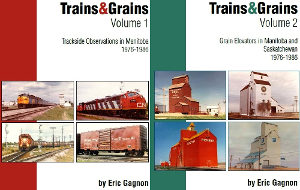 Palliser Expedition, annotated timetables, old Moose Jaw boosterism & station/yard in 1989. A look at old maps of the area, early surveying and settlers. Bonus: Arthur Meighen! Trip through southern Saskatchewan. 1950s employee timetables, 1939 public timetable. Trip continues through southern Saskatchewan. Maps, timetables and surprises! Continuing our circle tour day trip, we also look at the history of the Portal Subdivision. Finishing our circle tour day trip. Estevan Sub employee timetable from 1950. Sault Ste Marie, ACR and Algoma Steel; Portage CN and CP trains and track details; Deep roots! ; VIA's little Portage railway; Postcard: Winnipeg Union Station circa the Great War. CP west yard tracks; Can-Oat; Burnside; Trackwork in the east yards; There was none such as the Nonsuch .. Prince Rupert + 2 French guys = 1.5 million square miles; Finishing up at Kearns. Maps, the Official Guide entry for 1887 and interior/exterior of a colonist car from 1889. A 1904 engineering textbook discusses switchback and tunnel construction. Diagrams show the GN switchbacks and first Cascade Tunnel. The Northern Pacific Stampede Tunnel construction is shown. A system map, Winnipeg trains, named trains and their equipment. Plus ... some GNR history with JJ Hill, prairie construction, Cascade switchbacks, maps, CNR CPR GNR profiles. Sleeping car accommodation on Great Northern trains is illustrated in the timetable. Some of the electric motive power used in the Cascade Tunnels is shown. Information from a research paper prepared by Charles Bohi and Leslie Kozma. Sent to me by Charles Bohi. Includes a link to the original paper (PDF), maps and 1930s world wheat data.